Deadline extended: application period open until the 25th of March, 2019. For any questions (e.g. logistics or application), please contact degrowthsummerschool@gmail.com. Societal ever-expanding requirements have led to global competition for resources, and wealth being concentrated in a few hands. Dramatic societal crises and environmental conflicts emerge both in the South and in the North. The growth narrative builds on a very important belief: the idea that if we consume and possess more, we will be happier. However, from farmers’ protests in Delhi to buy nothing days, people stand against the present growth narrative and demand a different way of life that does not associate consumption with happiness. As a response, degrowth develops other narratives and ideas. Over the last ten years, they have become more and more recognized. Recently a post-growth petition was signed by 90000 people. Scientific publications and special issues on degrowth are not rare anymore. We now count 10 major international conferences on degrowth, and more to come. 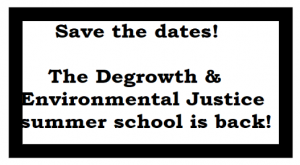 On this basis, this year the summer school will focus on the concrete responses that degrowth can give, and aims to prepare the next policy makers, activists, and academics to discuss degrowth alternatives. We will explore the various sources of degrowth, and their need to be integrated. The summer school will bring visions of degrowth in different sectors such as housing, transport, food, low-tech and energy, building new exciting stories. We also aim to practice horizontally governance and take account of all important perspectives, be it from the grass-roots or from policy makers. We believe that a stable collaboration, trust, and coordination between activists, practitioners and researchers leads to mutual learning towards a new path of socio-ecological transformations and inspiring narratives. The 2019 version of the summer school builds upon our previous experience and also includes many new discussions. We aim to respond to the challenges of our present context (climate change, economic crises, rise of extreme rights, “Gilets Jaune” demonstrations…) by disseminating cutting-edge research on degrowth and environmental justice. While the course will have a strong academic orientation, there will be a dedicated space for practice, activism and art. It becomes more evident that practice helps to think, art helps to explain, and activism helps to connect and challenge current thinking. You can find the tentative program here. The first week of the course will take place at the Institute of Environmental Science and Technology (Universitat Autonoma de Barcelona), where the theoretical foundations of environmental justice and degrowth will be laid out. This will be followed by going deeper into particular pressing problems and potential solutions of our times along with visiting exemplary projects and initiatives based on the principles of degrowth and relevant for environmental justice. The second week of the course will take place in Cerbère, in association with Can Decreix (see also Blog) a project of Research & Degrowth dedicated to put degrowth into practice in everyday life and habits. In this small village, the course gets deeper into degrowth transformation integrating the ideas of the first week. This summer school will propose alternatives to the standard teaching methods. Participants will work in small groups and use methodologies that enhance the collective wisdom through knowledge sharing, and visits to meaningful places. This year we encourage participants to come with some background on commons, eco-feminism, non-violence, north-south relations, environmental justice, open localism, or anti-extractivism. Particularly welcome are different strategies when confronting the growth world: alternative/opposition/adaptation… These will be supported by resources persons throughout the course. We expect participants to take part in the collective building of degrowth narratives in different sectors, as well as in organisational and emotional dynamics. The summer school is designated for academics as well as for activist-researchers from multiple disciplines and diverse geographical backgrounds. We welcome applications from Masters students, doctoral and post-doctoral researchers and community defenders and local activists from across the world. Deadline for applications is March 25th, 2019. Please send a single pdf document with your CV and a motivation letter of maximum one page explaining (a) your personal or professional engagement in degrowth and/or environmental justice and (b) your future plans after attending the summer school to degrowthsummerschool [at] gmail.com. The pdf document should be titled as your Surname_Name. The selection of participants will be announced by the April 1st, 2019. We aim at 35 participants from a diversity of geographical regions and academic disciplines. Once selected you are expected to present your research and/or project through a poster tour at the beginning of the course, and to present an assignment within a small group at the end of the school. More information on presentations, reading material and assignments will come after your acceptance. In addition, participants are expected to organize their food and accommodation in Barcelona. Different addresses will be provided. In Cerbère accommodation will be organized with local hotels and local organic food will be provided at a cost of about 150 € in total. 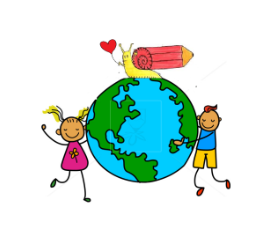 Students with mobility limitations, health issues, or allergies should contact us before the school. If possible come without flying and prepare for the Stay Grounded conference a week later in Barcelona. We try our best to grant equal possibilities of participation to everybody, we will try to have a weavers for students with economic difficulty by the set-up of a solidarity fund.